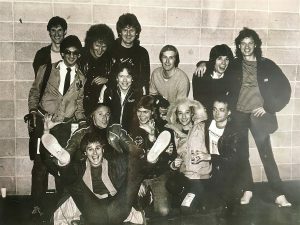 In celebration of 40 years of R&R we thought we’d share this wonderful photo with you taken backstage at The Pacific Coliseum in Vancouver BC, January of 1982. Streetheart was out on tour across Western Canada in support of their best selling “Streetheart” album. The boys were paid a post show visit from their friends Loverboy who were just off the road themselves and riding high on the huge success of “Get Lucky”. L/R in the back row, George Martin, (we don’t know the name of the fellow in this photo next to George), Paul Dean, Ted Ewasiuk, Daryl Gutheil, Jeff Neill and Scott Smith (RIP). In the middle, Ken “Spider” Sinnaeve, Rob Morrow (RIP), Bob Ego and Matthew Frenette. Up front Kenny Shields and Mike Reno hamming it up for the camera! Two great bands, still going strong, connected by a long history and by friendship. Great days and great memories… still being made!